Being a community volunteer reaps rewards far beyond the donation of time and talent. Lisa Marion has gained valuable self-confidence and improved at completing her volunteer tasks. Ashley Wilcox enjoys bringing smiles to nursing home residents when she visits. Kenny Bennett loves to play his guitar for patients at the hospital and nursing home where he volunteers. Monarch is honoring day program attendees Marion, Wilcox, Bennett and all the people we support who volunteer during National Volunteer Week, April 7-13. Established in 1974, National Volunteer Week is promoted by Points of Light, a nonprofit organization that mobilizes volunteers. 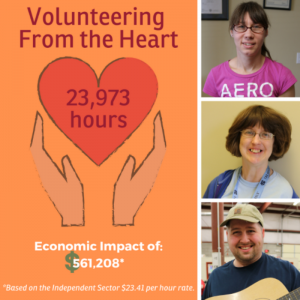 In 2018, the people we support dedicated 23,973 volunteer hours across North Carolina. Community organizations like Meals on Wheels, community parks, nursing homes, hospitals and service organizations benefited from their efforts, commitment and generosity. Long-term Services and Supports Executive Vice President and Chief Operating Officer Jim Kelley said the people we support are in their element when giving from the heart. “Communities across the state are fortunate to have dedicated and endearing support through Monarch volunteers. Our volunteers make an impact with their helping hands, smiles and warm hearts. Their hundreds of hours of hard work and efforts contribute to the success of organizations throughout the state,” Kelley stated. Lisa Marion, 40, a long-time attendee of Monarch’s Lighthouse Club of Currituck day program in Grandy, volunteers at the Kitty Hawk United Methodist Church and Meals on Wheels. Lighthouse Club Community Engagement Team Leader (CETL) Colleen Zoubek said the church has “totally embraced our group” welcoming a number of day program attendees as volunteers within their congregation. Marion’s activities at the church range from being a participant in the bell-ringing ensemble, assembling bulletins for services and assisting with community dinners. “Sometimes I stuff the bulletins. That is my favorite thing to do,” said Marion. Ashley Wilcox, 35, an attendee of Vocational Options of Hoke County (VOHC) in Raeford, volunteers five days a week at two nursing homes, Open Arms Retirement Center and Autumn Care. Her primary tasks when volunteering include calling bingo and spending time with the residents. “Every day she leaves to volunteer with a smile on her face and she returns with a smile on her face,” VOHC CETL Bruce Hurst remarked. Wilcox said the best part about volunteering at the nursing homes is the friendships that she has made. “Some of the residents don’t have family so just being there for them is good,” she said. Kenny Bennett, 30, day program attendee at Stokes Opportunity Center (SOC) volunteers at LifeBrite Hospital and Walnut Ridge Assisted Living. At LifeBrite, he shreds documents as well as seasonally tending to the garden among other tasks. SOC CETL Pamela Kreeger said Bennett is extremely dedicated to the organizations he serves having volunteered at LifeBrite for almost four years and does not like to miss his assignments. Bennett works under the premise that a good volunteer is always on time and likes to help people. “Helping people out is my favorite part and it’s pretty amazing,” Bennett noted, adding that he enjoys creating cards for the nursing home residents. Photo captions at right: top, Lisa Marion; center, Ashley Wilcox; bottom, Kenny Bennett.